This post was inspired by a post on the Bibliophemera blog which asked this about book trailers: "Is it or isn't it a bookmobile?". The Bibliophemera post includes images of three book trailers. I wrote previously about a 1937 publication of the American Library Association titled Book Automobiles. In that publication there is a chapter on "Book Trailers" which includes photographs (shown above) of the Gary (IN) Public Library book trailer and the Clark County Public Library in Springfield, OH. The chapter introduction indicates that, "The greatly increased use of trailers by motorists today has apparently given new impetus to the use of trailers by libraries." 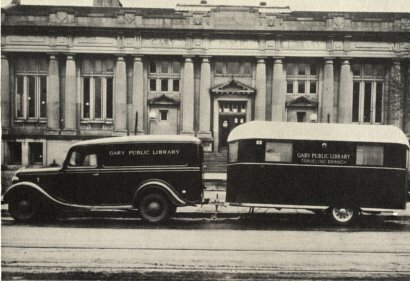 It notes that the Gary Public Library's book trailer is " a standard twelve-foot house trailer which is fitted up as a small branch library" and that "Its shelves hold 1,500 to 1,700 volumes." 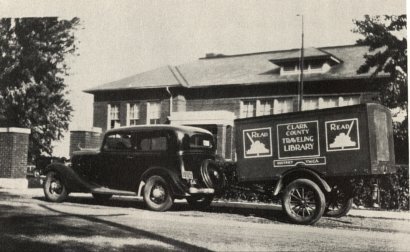 According to the ALA publication the book trailer for Clark County, OH was started by the Rural Committee of the Y.W.C.A.. The ALA publication describes a proposal by Henry Bailey Stevens, then Secretary of the Agricultural Extension Service of the University of New Hampshire, for the use of book trailers in a kind of traveling library system. He visualized " a trailer fitted with waterproof bookcase under lock and key and loaded with a choice collection of offerings. A chain of responsible volunteer community leaders, acting in their neighborhoods as assistant librarians. A system of chain telephoning and neighborly agreements. The trailer left for two or three days in a farmer's barn or yard. And this trailer hauled by cooperative agreement from point to point over the county and back again." 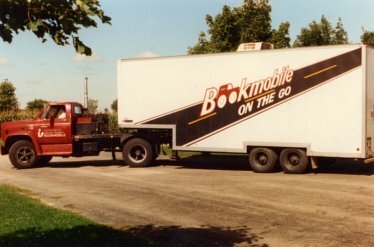 The Kenosha (WI) Public Library used book trailers for many years as did the Southwest Wisconsin Library System in Fennimore, WI. 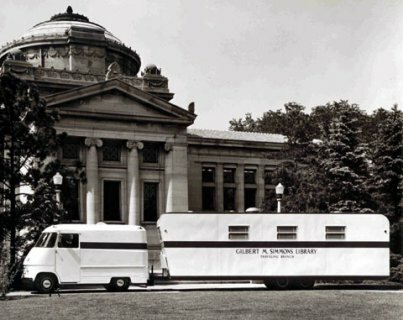 The American Libraries magazine has a Pinterest site showing numerous images of bookmobiles including a couple of book trailers. Great images and research, Larry! Really enjoyed seeing those examples and reading the library trailer history.